Although we had read about La Moskitia in our guidebook, we figured that without proper gear and equipment a trip into the “jungle” would be virtually impossible. Plus we figured it would make a great trip later in life, you know when we are just “vacationing.” All but giving up, we resigned ourselves to move on to Nicaragua. As luck would have it, we met an American in La Ceiba who had just come out of La Moskitia, doing the entire trip independently without a tour agency. Excited, we plugged him for details about cost and conditions and it soon became clear that not only was it completely do-able to see some of La Moskitia on our own, it was well within our budget. La Moskitia is called the “Little Amazon” by some. By others it is called jungle. Still by others, it is called home. Several indigenous groups, mainly Moskito and Pech, live in this foreboding wilderness where they still speak their native languages…and Spanish. Additionally, some archaeologists believe that the fabled lost city of the “White Maya” may be hidden within the region. 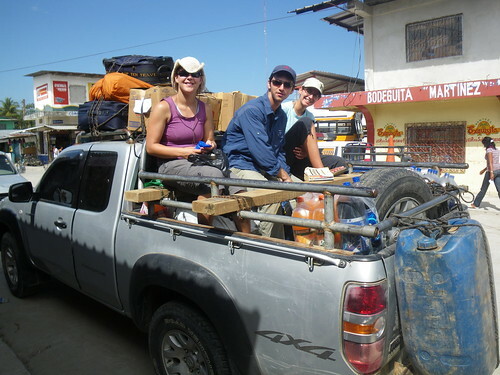 We began our trip into the jungle in a small city called Tocoa where we found a pickup truck (oh, there were many to choose from) that would take us ‘out there’. 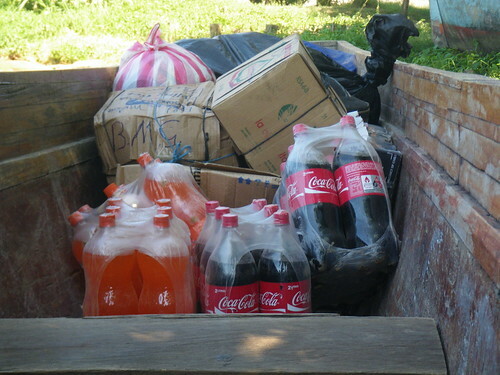 The ride in the back of this truck, jammed in with other people as well as essential supplies (mostly Coke & Pepsi products) for the villages we would pass along the way, was quite the adventure in itself. Once the paved road ended, the dust picked up and we found ourselves breathing dirt as we sped along. This didn’t last forever though as the dirt road quickly ended as well…meaning it was time for the beach. Speeding along the Caribbean shore at unknown speeds we’d feel the splash of the ocean and then lurch forward as the driver slammed on the brakes to avoid the incoming tide, a piece of drift wood, or the occasional horse. We sped along holding on for dear life for about an hour and a half as we stopped in several Garifuna villages dropping and picking up passengers and supplies. Finally, very much needing a beer to calm my nerves after the ride, we reached the extent of the “road” and hopped on a boat for the village of Plaplaya. We chose to sleep in Plaplaya this first night because we’d read it was turtle nesting season and there would be the opportunity to search out nests or release baby leather back turtles into the sea. Upon reaching Plaplaya we learned that this was all there was to do there…with the exception of killing exceedingly large spiders so that Jill would finally allow me to go to sleep. We introduced ourselves to Ismael who was the local turtle researcher and agreed to meet up after dark for a search of nests. We began our walk, which Ismael clearly thought would be a waste of time. After walking for about 3 minutes we were rewarded. No, we didn’t happen upon a nest, we happened upon the biggest turtle I’d ever seen in my entire life. The leather back was simply huge…way bigger than those so called giant tortoises that move two feet per year at the zoo. Probably about the size of a Manatee (don’t forget, we call those cows) so it was quite huge. 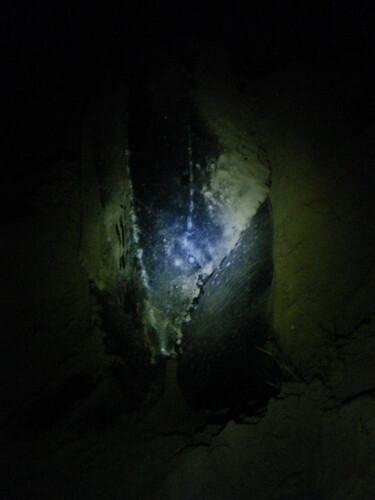 When we arrived it had already dug the hole (about a meter deep) to drop its eggs, but no eggs yet. Watching its movements reminded me of Disney World where you watch the anamatrnoic machines on the rides, it was just completely alien. 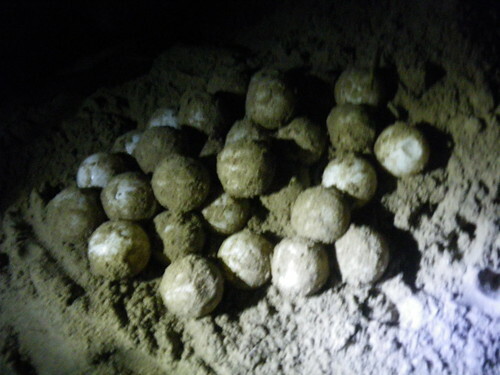 Eventually her eggs began to drop and from behind her we were able to see them fall and accumulate. Ismael set to removing them from the nest in order to bring them to a breeding facility where they would be kept safe from other animals [and humans] who would otherwise make a tasty snack. Ismael let us touch the racquetball sized eggs which were surprisingly soft and dented easily; makes sense given how they all fall. He also let us touch the shell of the mother turtle which was unsurprisingly leathery. By the time she was finished she had dropped 99 eggs and one small golf ball bit of food for her young once they hatched. With the sand flies wreaking havoc on our feet and the eggs needing to be brought back for protection we ultimately called it a night and headed in. All told our encounter lasted probably less than an hour but watching something so alien give birth was incredibly special. I had not read your posts for a long time so I’ve been catching the time now and I learn that you have experienced an earthquake recently! as you know but maybe you don’t remember, we left The Carribean islands because of this kind of events! We experienced many and the strongest one was 7.2 so you beat us. the wole difference is made by the structure of the building in which you are, if it’s carton or soft planks it’s okay, you won’t be hurt and you can get out of it quickly but if you are on the 3rd floor in a concrete house, either it shakes and resists or it falls down with you under! it’s a lot more dangerous. I suppose the houses are not really solid in this area so it’s all the more safe, luckily!